A couple of months ago, Samuel decided that, each night, he would like to read a few books to himself before going to sleep. Of course Kei and I read to the kids every night before bed, but this is just one of many ways in which Samuel is trying to assert his three year old independence. It began with reading in the dark until we told him it wasn’t good for his eyes. So Samuel moved to the other side of the room to read by the glow of his night light. After a while we caught on to this little trick and decided that we really should provide him with a safe way to read that won’t contribute to the genetic disposition he already has for bad eyesight (our kids don’t have the best odds for 20/20 vision). 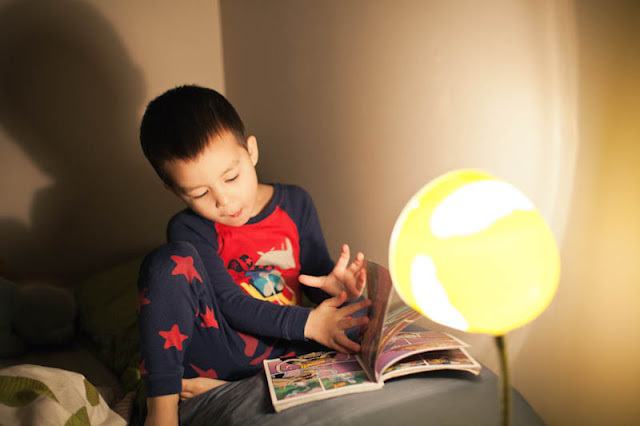 Finally, we bought him his own reading lamp and, let’s just say, it’s opened up a whole new world – one that has been ending at 9 or 10pm on some painfully long drawn out nights. He’s been cranky and unbearably difficult to get out of bed in the morning, but at least he’s picking up some essential (pre)pre-k reading skills in the meantime. Not that I can complain too much. I have vivid childhood memories of being told time and time again to turn off my light and go to sleep. Samuel and I are alike in many ways. But I digress. The primary goal of this post is share five of our favorite children’s books. The ones that are inspiring and entertaining a three year old and a six year old – not to mention their parents. I’ve mentioned this one before but it’s worth repeating. Stuck is an incredibly imaginative book that made Thomas laugh out loud the first time we read it together – and also the second time and the 20th time. I adore Oliver Jeffers and the book’s tag line ” a story about trying to solve a problem by throwing things at it”. One catch with this book is that it doesn’t seem to be widely available for purchase here in the US. Even Amazon ships from the UK. Finally, a book about Superheroes who are not affiliated with DC or Marvel. As much as I admire my boys’ dedication to Superman and his friends, I truly appreciate a book that encourages them to use their imagination and transform themselves into superheroes using what’s around them. Based on a story by Leo Tolsty with a very “zen” approach to problem solving. The most interesting thing about this book is how each of the boys can translate it based on their individual levels of maturity. This book relies mainly on the illustrations to tell the story – and what wonderful illustrations they are. Such a wonderfully creative story for all children, regardless of age. It does pain me a little to put this book on the list because I wasn’t exactly thrilled when Kei bought it at the school book fair. But I have to admit that it is interesting and fun to read with Thomas given his current obsession with animals. On each two page spread they pit one predator against another, comparing things like speed, brains and strength and declaring a winner. It’s written in such a way that it has to be read by putting on the voice of a dramatic television announcer “THIS WEEK ON PREDATOR SHOWDOWN.. SHOWDOWN…showdown…” Of course I recommend it particularly for six year old boys. So there you have it, book recommendations courtesy of the Ishida boys and their parents, guaranteed to keep everyone entertained – provided you have good lighting. This entry was posted in Five Things Friday, Life, Motherhood, Samuel, Thomas. Bookmark the permalink.